Calendula is one of the most frequently used remedies in homeopathic medicine! We suggest the you keep this remedy handy in a 30C and a 200C, as well as the topical cream or gel. 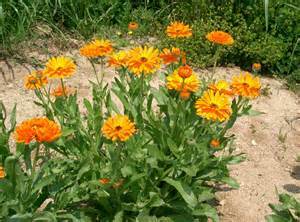 Give Calendula orally for the rapid healing of wounds; promotes healthy and rapid healing. Wounds that are raw, inflamed, red, stinging. Open cuts, lacerations, ragged or suppurated wounds. Calendula cream may be used topically for cuts and abrasions to keep the wounds from becoming infected. Wonderful antiseptic for these types of wounds with bleeding. The topical cream (not the gel) does not sting when you use it children's wounds before bandaging them. It is a wonderful remedy for after birth, especially in a C-section. Use it for diaper rash in babies. Apply it between diaper changes in a thin layer for promote rapid healing and healthy skin. For deeper cuts and wounds, you can soak the wound in a Calendula tincture for about 20 minutes to help draw out the pus, then bandage. Repeat this procedure before each change of clean bandages. This will promote very rapid healing, reduce the risk of infection and there will be less scaring. Give Calendula orally with watery dosing post surgically to prevent infection and promote rapid healing for surgical and dental procedures. NOTE: Do NOT use Arnica on these types of bleeding wounds. It can aggravate the skin and should not be used on bleeding cuts and wounds.